Over the past couple of weeks, the mention of Congress road is on everyone’s talk and how it has gone bad over the months. 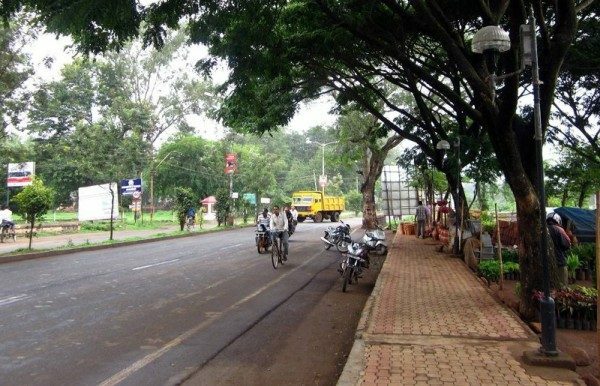 Now the Corporation has finalized that the Congress road will be made of Concrete after a suggestion of the consulting firm for Belagavi Smart city limited (BSCL). This suggestion was made about 6 months back and was sent for approval and in the meeting held on Saturday, Commissioner Sashidhar Kurer who is also MD BSCL said that Congress road will be made of concrete as due to trees the asphalt roads will not withstand the load and hence again break. The new Concrete Congress road will have Gutters, footpaths on both sides and also cycle track and also after all the cables and utility lines are put as once the Concrete road is made it would be difficult to dig it. The work can be commenced after the rain is over as per the commissioner. In the meantime, pavers would be fixed in the coming week on Congress road to make it easier for the commuters. If the railway line goes above ground level, on a bridge from near opposite Military Mahadev temple to after the fourth (Angol) gate, then all the road traffic woes on the Congress road would end for almost 20+ years in future. People and vehicles can easily go from Tilakwadi west to Tilakwadi east without the present day bottlenecks at the present day railway gates n this section. The railway bridge from Military Mahadev temple to beyond Angol 4th gate can be built in less than a year and with precision with the help from military engineers. The present gate bottlenecks are going to be a nuisance in just 1 years or less from now if the railway line remains at the ground level in this section anyway. So why doesn’t authorities re-plan the entire section development in the above manner?